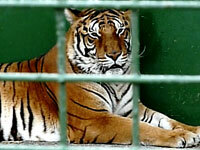 Animal Defenders International (ADI) has today revealed that big cats are performing in an English circus once more. A new lion and tiger act presented by Thomas Chipperfield has joined Jolly’s Circus, one of two remaining English circuses to perform with wild animals. Chipperfield had performed until very recently with Irish circus Duffy’s and speaking at the time about the departure of the act, Duffy’s owner admitted that big cats were dangerous and that “one wrong move…can be fatal”. ADI has expressed its concern for the welfare of the animals. Just last month the organisation condemned Jolly’s Circus after reports that it had tethered a mule, without food and water during the recent scorching weather. In addition, commenting about its animals in its application for a licence to perform with wild animals, Jolly’s has stated how camels “can survive with very little or a very lot” and also how their raccoon had “embraced the hustle bustle of circus life”. Thomas Chipperfield is a relative of the notorious Mary Chipperfield, who was prosecuted for animal cruelty, along with her husband Roger Cawley and elephant keeper (and government zoo inspector) Steve Gills in 1998/9 after an investigation by ADI. The organisation’s expose shook the industry to its core and just five years later the number of circuses with wild animals had fallen from 20 to just 4. Prior to the introduction of the new act, the last circus to perform with tigers was the Great British Circus, who are not on the road this year, having shipped their big cats off to Courtney Brothers in Ireland. The Coalition government has drafted legislation to prohibit the use of wild animals in circuses and ADI is waiting to hear whether recommendations by the Environment, Food and Rural Affairs Committee (EFRA) to apply the ban solely to elephants and big cats have been considered. ADI has expressed its profound disappointment at this ill-informed suggestion, which flies in the face of overwhelming public opposition to the use of ALL wild animals in circuses, which has remained consistently high for over 15 years. ADI is urging the government to bring forward the suggested date for the ban of 1 December 2015 and is calling on Scotland and Northern Ireland to introduce a similar prohibition. The Welsh Assembly has already pledged its support for the ban. National restrictions on performing animals in travelling circuses, either wild or all animals, have been enacted in 22 countries, including Austria, Bolivia, Bosnia & Herzegovina, Colombia, Costa Rica, Croatia, Cyprus, Czech Republic, Denmark, Ecuador, Finland, Greece, Hungary, India, Israel, Poland, Portugal, Peru, Singapore, Sweden and Taiwan.